The new 'African dinosaurs' exhibit at the Iziko South African Museum in Cape Town capitalises on a fascination that almost every person - old and (especially) young - has with dinosaurs. A highway into the human imagination, dinosaurs can often be the spark that ignites the explosion we call learning; hence this National Lottery-funded exhibit is open-planned to accommodate large school groups. It is not surprising that these rock stars of natural history have been afforded the museum's prime space in a sylvan gallery overlooking Government Avenue and stretching three floors to the roof (a space that is just big enough to accommodate a juvenile Sauropod). Rather than rushing straight to the 'African dinosaurs' exhibit, it is a good idea to walk through the 'Stone bones' exhibit first, because the creatures featured there are the evolutionary precursors to dinosaurs and set the scene for the story of their evolution and radiation. In this showcase of the reptiles and mammal-like reptiles that roamed the Karoo basin during the Permian Period, between 280 and 255 million years ago (Ma), there are gems such as the Oudenodon skeleton, a fossil in which the rock is chipped away to expose an animal lying on its side, with its neck and head twisted upwards. The tangle of ribs, legs and vertebrae is almost complete, minus a few bones from the hindquarters. Actual toothmarks and a huge scavenger's tooth lying amongst the bones are the keys to unravelling this tale: from the tooth, scientists were able to identify the scavengers as Gorgonopsians. In a bloody display to rival any kill on the African savannah today, this ancient scene was recreated using exactly the same pose as that of the fossil skeleton. A reconstructed cast of the Oudenodon skeleton was then clothed in a torn, leathery skin and two attendant Gorgonopsians stand hissing over the disembowelled carcass, scraps of meat dangling from their jaws. The juxtaposition of fossilised bones and realistic dioramas characterise both exhibits. The 'Stone bones' exhibit ends with depictions of the severe drought and massive volcanic eruptions that occurred about 251 Ma, events which changed the face of the planet and precipitated the greatest mass extinction in the Earth's history. The few surviving lineages are thought to have given rise to the mammals and dinosaurs in the late-Triassic Period and it was the vacant niches left by these mammal-like reptiles that allowed the dinosaurs to radiate into some of the splendid forms seen in the 'African dinosaurs' exhibit. The entrance to the 'African dinosaurs' exhibit is flanked by a massive skull which seems to have been taken straight out of Jurassic Park. Except that this skull is not from Tyrannosaurus rex, but from the largest carnivore ever to have walked the earth, an animal whose fossils have been found only in North Africa - the shark-toothed dinosaur, Carcharodontosaurus. A slightly confusing sequence of displays follows on from the entrance, starting with a fossil of Euparkeria, the common ancestor of dinosaurs and crocodiles (dated to approximately 230 Ma) and followed by the extinction of the dinosaurs (approximately 65 Ma) and the evolution of birds (approximately 130 Ma). Luckily, you can work out where you are in the museum's 'time machine' by referring to the time scales associated with each fossil or event. The chronology becomes more settled after the first diorama, set about 190 Ma, which features two medium-sized dinosaurs which have, by this stage, already started their impressive radiation. In a desert backdrop from Dead Pan in Namibia, the two dinosaurs eye each other out. Syntarsus, the stealth hunter, skulks behind a fallen tree trunk, ready to dart in and steal the newly laid eggs from the nest of Massospondylus, the first fully herbivorous prosauropod. Although this giraffe-necked herbivore seems slightly out of place in the treeless desert scene, it is quite apparent from the rocks in which the fossils are found that these dinosaurs inhabited an arid environment. Despite the presence of grass, which made its first appearance only 67 Ma, and the skeletons of angiosperm trees, which would have appeared only in the Cretaceous Period, about 144 Ma, the realism depicted in these dioramas far exceeds those of the 'Stone bones' exhibit. 'African dinosaurs' is part art and part science. The artistry is in the beautiful sculptures by Steven Saunders and his team, who work mostly for the film industry. The veracity of his choices for skin colours, textures and the creatures' eyes will probably never be known with any certainty, but the accompanying information on the biology of these animals reflects over a century of research on the real fossils that accompany each diorama. Roger Smith, the curator of this exhibit, is clearly no stranger to bringing bright, vibrant science to the public. 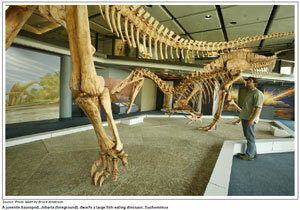 The exhibit captures the radiation of the African dinosaurs into multiple niches. The enormous fish eating Suchomimus, with its long, thin, hooked jaw is displayed as an impressive, full-sized skeletal cast. The skeletal cast of a juvenile Sauropod, Jobaria, also towers over visitors who gawk upwards in amazement, children ducking and hiding behind the legs of their parents. The impressive skull of a monstrous crocodilian is eerily lit and huge murals depicting these gigantic beasts give colour to the Cretaceous Period exhibits. By the time the massive sharktoothed dinosaur, Carcharodontosaurus, crossed the African landscape in the Cretaceous Period, mammals had already been around for 100 million years. As such, they are depicted as small insectivores living amongst the terrible lizards, awaiting their time in the sun. The age of mammals is precipitated by a dark meteorite event about 65 Ma. The exhibit attempts to accurately reconstruct the events that led to the extinction of the dinosaurs, clearly showing all the dinosaur lineages becoming extinct, except for the lineage that gave rise to birds, which live amongst us today as the dinosaurs' only living direct descendants. The exhibit highlights the fact that, in addition to South Africa's impressive abundance of mammal-like reptile fossils (which have dominated the displays of the South African Museum for so many years), Africa also has a rich dinosaur heritage. Although most specimens hail from the arid parts of North Africa, where it is often easier to find fossils, there have also been some very important finds in Lesotho and in South Africa's Eastern Cape Province. This display proves that African dinosaurs clearly rival their more famous American counterparts, such as T. rex, in size, diversity and even scientific importance. 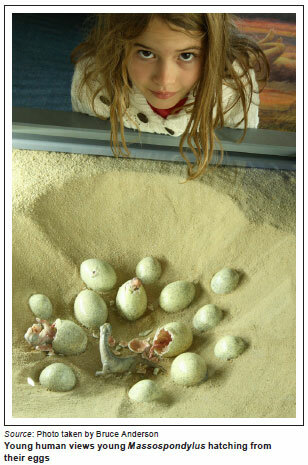 For example, the exhibit's beautifully preserved Euparkeria, which has been found only near Aliwal North in the Eastern Cape, is scientifically important because it is thought to be ancestral to crocodiles, dinosaurs and, eventually, birds; as are the tiny Massospondylous hatchlings that have given scientists insights into the parental care of dinosaurs. This exhibit depicts an important part of Africa's ancient natural history and it is hoped that the gaps on either side of the 'Stone bones' and 'African dinosaurs' exhibits will be filled by future exhibits on the ancient seas and more contemporary fossils, including the evolution of humans. The diversity and scientific importance of this exhibit make it worth visiting, but the exhibit's life, created through pictures, dioramas and solid scientific research into the ecology of these animals, make it well worth returning time and again.